Keeping track of the latest market developments, we are introducing a wide range of Aavi Customized Shower Enclosure with Acrylic Sheet for our esteemed clients. Our well facilitated infrastructural unit enables us to make a highly qualitative Shower Cubicles which is developed by making use of excellent quality components. In order to cater the diversified demands of our clients, we have been able to provide a unique range of Glass Shower Cubicle. 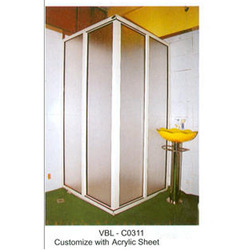 We are proficient to offer an excellent quality assortment of Designer Shower Cubical Glasses to valued customers. stainless steel L connector, handle, lock , hinged, redu section, channal, rod, seal, labour, silicon, cartage etc include for rate. Appealing Glass Shower Cubicle, offered by us, is ideal to add worth to your establishment. Our Glass Shower Cubicle is designed from crack resistance glasses in varied dimensions and designs as per the needs of the clients. Glass Shower Cubicle, offered by us, is reckoned for its quality, beauty and longevity.